The Dachshund is an unusual dog. It combines the activity of a true hunter, and the charm of plush toy. For many years, dachshunds are loyal and loving human friends. 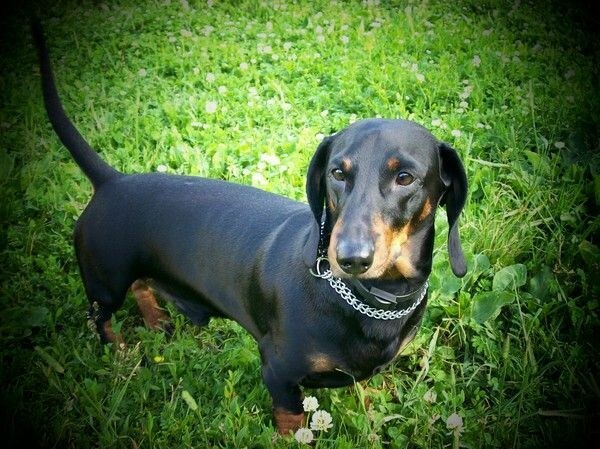 The Dachshund is popular all over the world dog breed. Despite his small stature, long torso and short legs, these dogs are agile and muscular creatures. It's inventive, playful and mischievous creatures. Proper maintenance fees – the guarantee of health of dogs and peace of mind to its owner. One of the main rules of the maintenance of this animal is its timely walking. After walking paws pet must be well wiped with a damp cloth. If the dog is not afraid of water, it is recommended to wash her paws under running water. If the rate while walking is very dirty, it is necessary to wash all. It is necessary to use only special shampoos designed for dogs of this breed. Fees are divided into shorthaired, longhaired and Wirehaired dogs. The type of their wool will depend on appropriate care. For example, dogs with short hair after a walk, wipe with a towel, and longhaired dachshunds should be brushed with a special brush. Despite the fact that most of the people acquire exactly the short-haired Dachshund, the coat of their Pets can be wound parasites such as mites or fleas. For the removal of various parasites use coal-tar soap, special drops, sprays, powders, etc. Before use of a drug, you should review the manual. The fact is that any medication intended for a pet, designed for his age, his weight, and the appearance of its coat. Daily walks are important not only for taxes but also for any other dog. Correct walking dachshunds means double benefit: first, it reduces the risk that the dog will celebrate the need in the house, and secondly, the pet slowly, but surely, will explore the nature, to communicate with their fellows, to frolic and to maintain their health in normal. Should as often as possible to walk with puppies Dachshund: it makes them less skittish and more sociable. By the way, to walk the puppies after vaccination. To dog adult Dachshund brought her the maximum benefit, you must follow a few rules. First, we need to choose new routes. This will make a walk in another new adventure. Secondly, it is necessary to remember about the safety of walking your dog. The fact that taxes become less manageable, as distracted by external noise. You must keep your dog on a leash, so that she accidentally got lost or ran over by a car. You need to remember that roaming fees are no less than 3 times per day. The duration of the walk must be at least 20 minutes. That's enough time to pet relieve themselves, interacted with other dogs, enjoying the air and ran about happily. In winter, the duration of walking should be about 10 minutes. In winter, the fees recommended to buy or to sew warm clothes. Your pet should be fed primarily meat: beef, pork, chicken, lamb. Happy Dachshund eat fish. In any case can not give these dogs bones! From them no nutritional value, but suffer and teeth, and intestines. Cereals as source of carbohydrates, will also be useful for taks. Do not forget about vegetables and fruits. As for more power you can use milk and milk products, seafood, bakery products and so on. You cannot overfeed your Dachshund, as it may lead to obesity, while the load on the spine will increase, and can cause injury.